Premier Mastic Asphalt is here to help when you require heavy-duty flat roofing to meet the most demanding environmental requirements. Industrial roofing places particularly stringent demands on standards of waterproofing, mechanical and chemical resistance, and simplicity of maintenance. Polymer-modified mastic asphalt (PMMA) is particularly suited to meet these demands, being a highly-developed modern material with proven effectiveness under the most demanding conditions. Equipment which descends through a roof - such as pipes, vents and cowlings, etc. 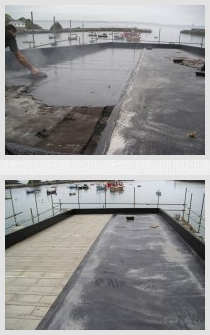 - needs the most careful attention to details of installation, to ensure durable and effective waterproofing. PMMA can only be applied by approved contractors. In this way the entire industry can offer comprehensive guarantees with complete confidence in both labour and materials. The life of such a roof will be measured not in years but in decades. We at PMA are proud to be recognised as the region's leading proponent of mastic asphalt. We offer the full range of design, installation and maintenance services, including regular surveys to national standards, so that you can experience a roof that is completely dependable and thus reassuring. If your requirements are for single-ply or built-up felt, we have the expertise and experience to ensure your needs are met to the highest of standards in these systems too.